Light is one of the oldest physical agents known to man! Its origin can be traced to the Greeks whose physicians frequently prescribed a form of light treatment called heliotherapy. Light is one of the oldest physical agents known to man. Its origin can be traced to the Greeks whose physicians frequently prescribed a form of light treatment called heliotherapy. We are excited to introduce this state of the art therapy to assist you on their journey to health. Living Well Dallas Chiropractic now offers low level laser therapy (also known as cold laser therapy) utilizing the MR4 ACTIVE by Multi Radiance Medical. Cold Laser Therapy promotes cellular activity, including but not limited to: enzyme and collagen production; increased ATP production; and mitochondrial activity. This increased cellular production improves the rate of healing while also easing pain and creating lasting changes within the body. The increased collagen production also decreases scar tissue. This process is similar to photosyntheses but you are the plant and the laser is the sun. The body absorbs the light and uses it to activate cellular activity for repair and healing on a cellular level. 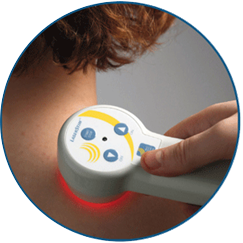 Therapeutically Low Level Laser Therapy has been shown to decrease pain, increase circulation of blood and lymph, and speed up growth and repair mechanisms in the body. Superior Alternative to: Analgesics, NSAID's, other Medications, and other Modalities. Yes. Laser treatments are drug-free and non-invasive. However, since lasers produce a high intensity light, one should never shine the laser directly into the eye. Furthermore, it is recommended that the laser device not be used directly on any neoplasmic tissue. Pregnant women should refrain from laser treatments applied directly to the abdomen. Also people with pacemakers should not use laser treatments near the heart.